Leader of the Lewis and Clark Expedition (aka Corps of Discovery). 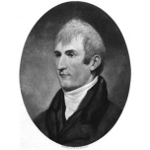 2 Ambrose, Stephen E., Undaunted Courage: Meriwether Lewis, Thomas Jefferson, and the Opening of the American West, New York: Simon and Schuster (1996). 3 McAllister, John Meriwether, ed. and Lura Boulton Tandy, Genealogies of the Lewis and Kindred Families, Columbia, Missouri: E. W. Stephens Publishing Company (1906), 42, Ancestry.com (Online Database).